When the British Army first stepped ashore in Egypt, in March 1801, the tactical unit was the battalion, not the regiment, although most regiments had just one battalion but some Guards and others had two or more. The typical battalion consisted of 10 companies, of which two - the flank companies - consisted of grenadiers and light infantry. This single company in each battalion formed most of Britain’s native light infantry, although the 60th regiment already had battalions of entirely light and rifle infantry, and more regiments would follow suit as the Napoleonic Wars progressed. The official headgear for light infantry was the crested cap often called the Tarleton, and most of the figures in this set are following this regulation. However as with any infantry the men soon found the sun and heat of Egypt hard to bear and many took to wearing a brimmed hat, which it is pleasing to note can be seen on two of the poses here. One man has gone further and wears a bandana - not part of official issue but possible nonetheless. The rest of the uniform was as for the line infantry, being a short-tailed single-breasted closed coat with breeches and gaiters, often covered by loose trousers as is the case with some of these figures. The uniform here is fine except that some of the men are clearly wearing a double-breasted coat which is quite wrong. However the chunky style and the exaggerated width of straps means on many figures the coat is entirely obscured, so luckily this mistake is not easy to detect. The officer figure also wears a double-breasted coat, but in his case this is correct, as are the wings on the coats of both him and his men. Officers usually had long-tailed coats, but those of the light infantry had short tails like their men, and this officer is happily correct in that respect too. Finally he correctly has a gorget, sash and light cavalry-type sword along with boots that also reflect his 'light' status. Items of kit for light infantry were much the same as for the battalion men, and these figures correctly have the haversack, bayonet, canteen and cartridge pouch on their person. None have knapsacks, which is fine, although we would have liked some to have had a rolled blanket. The poses consist of a good many men in the act of loading or firing, plus a few advancing or marching. Few have a bayonet attached - it was not the job of light infantry to advance at the point of the bayonet, although they could do so if necessary. Perhaps the best to be said of the poses is they are conventional and all are useful, but often quite flat and nothing particularly noteworthy. The sculpting is of the same style and standard as the corresponding line infantry, which is not that great. 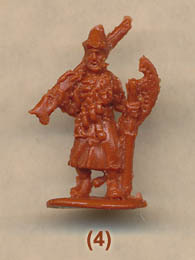 The muskets in particular and very wide and flat, but the detail is quite good if sometimes exaggerated in size. The faces are fair but the officer is remarkable in that he either has a serious facial deformity or else he has a beard. Beards were not permitted for officers at this time, and although the possibility that one might be grown for some reason cannot be completely ruled out it seems doubtful, particularly given the short duration of this campaign, so we were not pleased to see this very indistinct feature. There is almost no flash on any of these figures, which is what we would expect of Strelets these days. Returning to the subject of hair, some of the figures seem to be missing the queue that they should have, and do not even have one tucked under their hat. This and the double-breasted coat are the main accuracy problems, which luckily are both hard to spot at a glance. Otherwise accuracy is good, and the variety of headgear is particularly nice to see. The sculpting is not good compared to the best being made today, and the poses are functional but nothing more, yet this set does the job and for many that will be good enough.